A widely held prescription to promote faster economic growth in the U.S. can be summarized simply: government keep out. The point of view holds that, except on rare occasions, government should not intrude in markets and taxes should be low. Government spending should be restrained and, for the most part, government finances should be kept in balance, even at the cost of limiting social investment in public goods. Wages should not be supported by government regulations or social programs but eyed closely and disciplined if they rise too fast because they are a source of inflation. One legitimate role of government is to promote savings over consumption. These propositions are basically the new consensus, which crosses ideological and party lines. Of course, agreement and disagreement about these ideas abound. Some Republican politicians justify large budget deficits if they are produced by tax cuts that will, they say, create incentives to invest and work and ultimately “starve the beast.” By contrast, many Democrats argue to greater or lesser degree that balancing the federal budget takes precedence over cutting taxes or new public programs because deficits will drain the national savings and raise interest rates. There remains substantial agreement across political lines that tighter monetary policies are appropriate when wages run at growth rates deemed too high to maintain annual rates of inflation at 2% or so. Today’s conventional policy recommendations are leading the nation astray. They rest on two questionable assumptions, neither as well-supported by theory or history as their advocates claim. The first is that the long-run growth potential of an economy is wholly determined and indeed fixed by its productive capacity (physical and human capital and technological know-how). The second is that this productive capacity will be fully utilized by the economy as long as markets are encumbered as little as possible by government regulation. In other words, savings will generally be fully invested, labor fully utilized, and potential innovation fully exploited as long as government keeps out. But such a prescription, though it contains elements of truth, is a recipe for stunting economic growth, not maximizing it. And it is endangering, not protecting, the nation’s future. The current view has two central problems. The first is that an economy’s productive capacity is not fixed. Rapid economic growth expands the capacity to produce, innovate, and invent in key ways. It makes possible the development of economies of scale (falling per unit costs as production rises) and increases opportunities to learn-by-doing, a key source of rising productivity and innovation. Growth itself breeds more investment in research and more ideas beget still more ideas. Higher wages can contribute to faster growth and rising potential productivity by supporting this process. Rather than thinking that an increase in wages will raise unit labor costs because productivity is fixed, rising wages may raise rates of productivity growth, thus reducing unit labor costs. Indeed, despite the conventional wisdom, economic history supports the relationship between high wages, capital investment, and productivity growth. The second problem with the conventional view is that the private sector alone cannot be counted on to make the investments in public goods that maximize economic and social returns. In other words, the growth of the stock of human capital and technical know-how will flag without government support. Early childhood education is just one example of extraordinary social returns that are tragically neglected in the current policy environment. Economists acknowledge that private markets often fail to create adequate incentives to support public investments with high social returns. Thus, government must be a participant in building an economy’s productive capacity. Yet many minimize this obligation, especially in a time when budget deficits receive so much attention. Given the enormous returns to some public investments and the relative cheapness of reasonable levels of government borrowing for a nation like the United States, public investment by the government is a good deal even if deficit-financed. Consider what today’s conventional wisdom has wrought. The nation’s policy makers consistently fear that wages might rise too rapidly, even after 30 years that have produced the slowest rate of wage growth in the nation’s industrial history. Yet until the early 1970s, America always paid the highest wages in the world. It is a nation whose leaders cite the country’s own history to argue that minimal government is the best government. But the role of government was always significant in America. It supported the schools and the canals, radical land reform policies, the railroads and the highways, and new technologies. As government spending grew in America in the 20th century, the economy grew faster. It is a nation whose leaders claim that tax cuts are the best route to economic growth. Yet tax rates rose in America throughout the 20th century over a period in which the United States became the strongest economy in the world. High wages and rapid capital investment growth have clearly been linked in America. They were linked during the boom of the late 1990s and during the Golden Age of the 1950s and 1960s. In America since 2001, however, wages have stagnated and capital investment, despite high profits, has been disappointing. Similarly in Europe, wage growth has been contained but the growth of capital investment and of gross domestic product has been slow. A long and distinguished school of economic thought, which can be described as demand-led growth theory, helps explain this experience. Private capacity building responds to future expectations. In the 1990s, rapid wage growth helped convince the private sector that sales would be robust in the future, so present investment was warranted. Since the recession’s trough in 2001, interest rates have been low and corporate profits historically high. Yet this immense pool of potential investment has not translated into robust growth in productive capacity. Why? Demand-led growth theory would argue that lackluster wage performance and inadequate government stimulus have contributed critically to this disappointing result. Broad-based wage growth, besides being desirable on social justice grounds, also contains the seeds to start the next investment recovery. This paper, then, will make a comprehensive case, based on theory, history, and empirical observation, for policies based on demand-led growth theory and the social returns of public investment. These are the foundation for future economic growth. Perhaps this case cannot be as neatly summed up as today’s conventional wisdom—government keep out—yet it is the more compelling argument. Over time, the income lost due to even small annual shortfalls in economic growth cumulate massively, and the costs of following the conventional wisdom, which has left us poorer, are too high. Three recent economic scenarios in the United States and Europe have seriously challenged the conventional thinking of both conservative and progressive economists about the relationship between profit rates, capital investment, and wages. The first challenge is the performance of the U.S. economy since 2001, when the current recovery and expansion began. 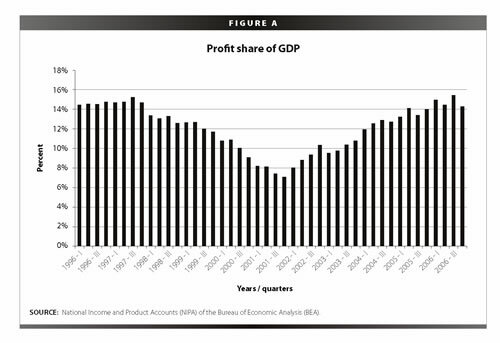 Profits have risen sharply in the past five years, to approximately 15% of gross domestic product, a share equal to the highest levels of the boom of the 1990s (see Figure A). But capital investment has fallen as a share of GDP by two percentage points from 1999 highs. In the meantime, wages have failed to keep pace with rapid gains in productivity. The median hourly wage has been flat since 2001 in real terms, up just 1.3% (and down 1.3% for men), and median family income is up only slightly from the levels reached in 1999 despite five years of GDP growth. Why this disconnect? Rising profitability and a level of wages set in a deregulated and less-unionized labor market should raise all economic boats, many mainstream economists tell us. Higher profits should lead to more capital investment and ultimately to faster growth in productivity, which in turn should mean higher wages. This is the heart of the capitalist contract. Capital investment could be lagging for several reasons. For example, profits have been used to purchase company shares in order to raise earnings per share, thus satisfying shareholders. Capital investment may also have been channeled overseas. But there is no sensible explanation of the stagnation of wages. Had capital investment remained strong and had productivity kept growing rapidly, one could possibly make a case that wages would eventually again catch up with productivity growth. Unfortunately, it is more likely the case that currently weak productivity gains will induce the Federal Reserve to step on the monetary brakes by raising interest rates should wages rise more than meekly in coming quarters. These higher interest rates will in turn restrain growth and weaken employment. The second example of recent events challenging conventional economic wisdom about profits, investment, and wages is the boom of the 1990s. In the late 1990s, GDP rose rapidly, and wages increased for all income levels; labor’s share of GDP had begun rising significantly by 1997. Yet, capital investment continued to increase rapidly. At the time some economists attributed the boom to the Clinton tax increase, which helped reduce the budget deficit and increase national savings (Elmendorff, Liebman, and Wilcox 2002). But did we really save our way to prosperity? In reality, the Clinton tax increase probably had only a small part in the process—perhaps more psychological than real. It is widely accepted today that rapid technological change, rising wages, and looser monetary policy in the 1990s contributed more to the Clinton boom and its higher levels of profits, increased personal savings, and the budget surplus—the components of national savings—than did the tax increase. In fact, two notable economists who served in the Clinton administration, Alan Blinder and Janet Yellen, in their analysis of the rapid growth of the 1990s, do not even mention the rise in national savings as a causal factor in the 1990s boom (Blinder and Yellin 2001). Also, the Congressional Budget Office attributed only about one-fourth of increased federal tax revenues of later years to the Clinton tax hikes (Feldstein 2002). Thus, high wages, it turned out, were completely compatible with high levels of capital investment and rapid economic growth in the 1990s, just as they were in America’s golden age of the 1950s and 1960s. A third recent challenge to mainstream economic thinking regarding a rising profit share and restrained wage growth is the economic experience of Western Europe over the past quarter century.2 The current refrain in Europe, and among Americans writing about Europe, is that the path to sustained and rapid economic growth is the restraint of the wage bill, largely through deregulation, and a consequent improvement in profits. Since 1980, wages have grown slowly as deregulation has spread, and monetary authorities have maintained a stringent, even tight policy. In many nations, the wage share has fallen and profits have grown more rapidly, but to what end? Capital investment has fallen as a share of GDP, and growth has fallen short of hopes or expectations (Naastepad and Storm 2006-07). These experiences suggest that the mainstream views of the causes of economic growth have been narrow and over-simplified. The stranglehold on economic theory has inhibited discussion about more constructive policy options. The mainstream or neo-classical view places an emphasis on reduced government spending, higher profits, and greater incentives for savings while it tends to neglect the level of wages, public investment, and well-implemented regulations. But neither higher savings, nor tax cuts, nor balanced budgets are alone or together likely to lead America to more rapid growth, even over the long run. In contrast, demand-led growth theory argues that government spending, both as a stimulant for capital investment and as a source of needed social investment, as well as accommodating monetary policy and higher wages, can raise rates of economic growth over time. Our main contention is that high rates of growth of demand can enhance productivity and the capacity of an economy to grow at non-inflationary rates. Savings are ultimately necessary, but it is faster growth that will increase savings as both consumers and businesses make more money. Moreover, demand growth, rather than driving out private investment, might encourage still more investment (Eisner 1986). In this scenario, then, policies that stimulate demand and high wages are critical, not merely to social justice but also to economic growth and efficiency in the long term. 1. Federal budget balancing is less important than widely assumed. 2. Policies that increase wages are not merely a matter of social justice but can enhance growth. These policies include mandated minimum wages and living wages, anti-poverty programs, extended and more generous unemployment insurance, job search and job training programs, and the expansion of rights to unionization and collective bargaining. 3. Monetary policy is generally too restrictive and inflation targets too stringent. Stimulative policies that raise employment are less inflationary than generally believed because they can improve productivity and ultimately even reduce unit labor costs. They can be coupled with regulatory and watchdog policies that restrain financial speculation. Currently, one policy is used to meet two paradoxical objectives, a classic managerial error. 4. Deficits can be justified even in times of full utilization of resources if they result from public investment in neglected areas with high potential financial and social returns, such as early education or transportation infrastructure. The nation should begin making formal projections of the future tax revenues and social benefits of such government investment. In demand-led growth theory, the penalty for underutilizing resources is high, for two reasons: (1) failure to utilize resources neglects opportunities to raise productivity because it can lead to reduced incentives for capital investment and multiple lost opportunities to improve productivity through economies of scale, learning by doing, and technological spillovers; (2) underutilizing resources forgoes the opportunity to create savings endogenously through increased profits and personal incomes. Not long ago this writer, addressing a conference about government intervention and public investment, brought with him a copy of Adam Smith’s Wealth of Nations as a comforting prop. A prominent mainstream macroeconomist who was also speaking at the conference was surprised. Why bring Adam Smith to a conference about government policies that support demand? Smith is of course most often invoked as the leading proponent of laissez-faire economics. The invisible hand—in which competition, the freedom to set prices, the division of labor into specialized tasks, and the pursuit of self-interest will all produce not merely multifarious products and high profits but also jobs—is what creates the wealth of nations. Smith is also cited as providing an intellectual foundation for the importance of savings, which enable a nation to invest in its land, resources, and capital equipment. But beyond the invisible hand and the importance of savings, Smith also emphasized a third point not as frequently cited by neo-classical economists. At the outset of the classic work, he asserted that a large market for goods and services was critical for growth. As he wrote in Chapter 3, the division of labor is “limited by the extent of the market.” Alluding to the famous pin factory, he asserted that if you separate the tasks of making a pin into a dozen-and-a-half constituent parts, a factory could produce thousands of times as many pins in a single day with the same number of workers as it did when one worker made one pin at a time. But the benefits of such enhanced potential productivity are only realized, he emphasized, if the market is large enough to absorb the new supply of pins. Further on in The Wealth of Nations, writing about the history of economic growth, Smith attributes incipient economic growth in the Middle Ages to Mediterranean trade and the early establishment of towns and cities. Only with the development of these markets—that is, adequate demand—did the invisible hand, the division of labor, and the accumulation of savings work their magic. Smith was not entirely clear about the order in which the factors of growth had their influence, or even to which to give priority. Nevertheless, for him the market—in other words, strong and rising demand—was an integral, critical, and perhaps even the most important factor in the growth of national wealth. This is a key point because it reminds us that, as we look to expand our range of options about economic growth, an acknowledgment of the role of demand is about as old as economics itself. Returning to the role of savings, neo-classical theory assumes that whatever a nation saves will ultimately be invested in resources and productive capital equipment. Economists agree that, after the fact, investment will equal savings. But how do we get to this point? According to Say’s Law, as formulated by the French economist J.B. Say, writing not long after Adam Smith, saving will create its own demand. If a nation saves more, the argument roughly goes (savings comprise what people save from their incomes, profits made by business, and government budget surpluses) interest rates will fall and banks and others will make more loans to willing borrowers. As rates fall and profits increase, business will invest more in capital equipment and plants, start new business, spend more on research, and so on. Productivity will reach its full potential, and wage increases will reflect the higher output per worker that results. In a world of global capital movements, the savings of an individual nation matter less, but the general relationship still governs. Say’s Law is actually more general than this. The common interpretation is that supply will create its own demand. That is, if a business builds a new plant to produce, say, vacuum cleaners, or builds a new store to sell discounted retail goods, there will be on balance enough customers to buy the product because prices will fall enough to attract new customers. In other words, Adam Smith’s concern about the limitation of the market is mistaken. This law was long questioned, but it was rigorously challenged by John Maynard Keynes in 1936 with the publication of The General Theory of Interest, Money, and Employment. Keynes noted that the excess supply of both savings and goods and services during the Great Depression did not create demand. This experience remains a cornerstone of modern demand-led theory, but newer strands of the theory hearken back to Adam Smith. Demand-led growth theory argues that demand can create its own supply, Say’s Law in reverse (Cornwall and Cornwall 2001). The thinking goes as follows. An economy can save more, but the savings might not be invested. It can build plants but, as Adam Smith feared, the market may be inadequate for the additional goods and services. Uncertainty over whether there will be customers at the needed price may restrain businesses from making investments. Institutional constraints, restraining social norms, or, in Keynes’ term, a lack of entrepreneurial animal spirits may inhibit investment. Therefore, at times a nation must increase demand to raise the rate of growth to higher levels. Many neo-classical economists interpret Keynes’ views as at best a short-term prescription for avoiding recession and maximizing production and incomes. But we argue that the same principles, and related ones unstated by Keynes, apply to the longer run. Increasing demand can raise rates of growth, produce profits, and create more and better-paying jobs in the long run. Most important, maintaining strong demand will itself increase productivity over time through the full utilization of resources and through greater economies of scale and more incentives and opportunities to invest, innovate, and work. Several commonplace claims dominate public policy discourse today and are partly based on versions of neo-classical growth theory. Do they really make sense? What is a more urgent purpose of economic policy than to raise earnings? Yet the worry is widespread on Wall Street and in Washington these days every time wages go up more than modestly. Wages can of course rise too rapidly. Wage growth can be inflationary if it cannot be supported by growing productivity over time. In such circumstances, wage growth may seriously undercut profit margins and inhibit business from investing or cause it to raise prices. High inflation at a certain point can indeed have deleterious and destabilizing effects, raising interest rates and creating uncertainty. But today, almost any increase in wages that leads to higher unit labor costs, however momentary, raises fears of renewed or higher inflation, and soon enough the Federal Reserve raises interest rates to staunch the rising wages. Demand-led theory supports another view. It suggests that rising wages under appropriate circumstances can enhance productivity by increasing aggregate demand, thereby more fully utilizing the nation’s resources and creating greater economies of scale, investment in research, and new products. The economic history of America provides a natural experiment about whether high wages are detrimental to growth. Economic historians like Jeffrey Williamson and Peter Lindert have shown that, until the early 1970s, America had paid on balance the highest wages in the world. In fact, historical data about wages in agriculture, construction trades, and manufacturing suggest that this has been the case since the colonial years.5 How did America grow so fast with such high wages if, as some mainstream theorists suggest, they eat away at profits and cause inflation? Part of the answer is that productivity grew rapidly. But the reason it is only part of the answer is that high and growing wages supported the full utilization of resources and helped enhance productivity over time. The economic historian H.J. Habakkuk argued that high wages induced business in America to invest aggressively in labor-saving, highly productive equipment and to search aggressively for methods to improve productivity. This view has several intellectual ancestors but it is compatible with neo-classical theory. Yet it is rarely invoked by mainstream economists these days. The demand-led view argues that higher wages and strong aggregate demand supported growing economies of scale in new manufacturing, retailing, and transportation industries, as well as more investment in general and particularly in research, which in turn generated more new ideas. Productivity improved as a consequence. “Closed case: tax cuts mean growth,” wrote former Tennessee Republican Senator Fred Thompson in the April 14, 2007 edition of the Wall Street Journal. Thompson wasn’t referring to Keynesian demand stimulus, of course, but the stimulus lower taxes allegedly produce by raising profits and after-tax incomes, and by channeling money from the public sector to the private sector. This view is based on a version of neo-classical growth theory which maintains that, by minimizing government intrusion, incentives will work most efficiently to stimulate productive investment. It does not consider that increases in profits at the expense of wages can undermine economic growth: without adequate demand for goods and services, business will not invest the savings. Those who hold Senator Thompson’s view with such confidence may be surprised that it is not supported by any reasonable review of the evidence. A cut in taxes supported by accommodative monetary policy will indeed stimulate economic growth, but largely for Keynesian reasons—not by improving incentives to save so much as by increasing aggregate demand. There is no general historical rule that taxes in general are bad for growth and low taxes good. Economist Joel Slemrod methodically analyzed studies on both sides of the issue and found that no case can be made to support the contention that lower levels of taxes lead to more growth in nations (Slemrod 1995). More recently, Peter Lindert derived similar results comparing performance across nations. As Lindert says, those who preach that lower taxes always means faster growth do so with such confidence they should be able to make a hands-down case that it is true. They never have (Lindert 2004). U.S. history also provides another example. Nancy L. Stokey, from the supply-side-oriented University of Chicago, and Sergio Rebelo of Northwestern argue that the U.S. income tax is a natural test of the assertion. They calculated that income tax revenue in the United States rose from about 2% of gross domestic product in 1913, when the income tax was first introduced, to 15% of GDP in 1942. Yet, in their words, “This large rise in income tax rates produced no noticeable effect on the average growth rate of the economy” (Stokey and Rebelo 1995). Since the early 1980s, when triple-digit billion dollar deficits became the norm, balancing the budget ironically became a rallying cry of the Democratic Party. By contrast, Republicans like Senator Thompson claim that high budget deficits are not detrimental to growth if they are the result of tax cuts, not more government spending. For further irony, surveys find that Americans who are Democrats are more concerned with the size of federal deficits these days than are Republicans, a reversal from two decades ago (Blinder and Krueger 2004). These views of the impact of deficits are narrow and, depending on circumstances, often incorrect. The Republican case is that lower taxes result in higher savings, profits, and incentives to work. The Democratic case is that budget deficits reduce national savings and crowd out private investment as interest rates rise. The basic thesis was succinctly expressed by Benjamin Friedman nearly 20 years ago: “The heart of the matter is that deficits absorb saving. When more of what we save goes to finance the deficit, less is available for other activities that also depend on borrowed funds. In the United States, most businesses rely heavily on bond issues or bank loans to finance inventories, to buy new machines, and to build new facilities. Most families pay only a part of the purchase price in cash when they buy a new house…and seven of every ten new cars are purchased with loans behind them. When government borrows to finance its deficit, therefore, companies that want to invest in new plants or new machines and families that want to buy new houses must compete among themselves all the harder for whatever saving is left” (Friedman 1988). But it is hard to make sense of this in the real world, especially the modern world. China, we know, has an enormous savings pool, but it would not be growing as fast as it does if it did not rely on export demand for 40% of GDP. The worry in China is a lack of domestic demand, in large part because of low wages. By contrast, the United States is growing despite low levels of savings, and such low savings rates are significantly the consequence of slow-growing or stagnant wages. To keep up their spending, American individuals and businesses have had to borrow substantially out of the savings pool of foreigners, but the levels of borrowing are not indefinitely sustainable. Benjamin Friedman’s version of supply-side growth economics rarely holds as simply as he stated it. National savings may rise, as they did in the late 1990s, but it would be difficult to attribute the growth largely to the Clinton tax increase. As Blinder and Yellen argue, the reduction in interest rates that followed the tax increases was more a matter of propitious timing than “any formula that can be repeated at will” (Blinder and Yellin 2001, 23). In sum, bond market investors were ripe for a shift in investor psychology. Moreover, the budget surpluses that followed, as Martin Feldstein noted, were in large part the consequence of other factors resulting from much faster economic growth, not the tax increase. Neo-classical growth theory is often referred to as supply-oriented growth theory, mainly because the policies it supports to stimulate economic growth are mostly limited to those from the supply side of the equation, and they presume increasing supply will automatically increase demand. Variants of the theory emphasize or de-emphasize basic factors of growth, and it is more technically correct to refer to neo-classical growth theories. And the number of theories keeps growing. For example, some neo-classical economists believe increases in national savings cannot raise the rate of economic growth. Others, especially on the basis of newer theories, argue that it can. Some believe that low tax rates are important incentives to growth, others do not. Many of the neo-classical theorists advocate government investment in research and development and education, as well as transportation infrastructure. These public goods are “supplied” to the economy, as are savings, and so all the variations of the neo-classical center are supply-oriented. They leave little or no room for demand factors. Growth theory in America has been dominated by the innovative model devised by Robert Solow in 1956 and 1957, for which he won a Nobel Prize (Solow 1956). Solow’s model can be thought of as a simple machine into which capital and labor are mixed in the most efficient quantities. Out of this mixture comes growth in the output of the economy per worker. Some of this increase can be ascribed to more capital equipment and some to increasing labor. The extra growth that cannot be ascribed specifically to both together is called the residual. Some economists now refer to this residual as total factor productivity—the productivity of the efficient combination of labor and capital. But the simple summary of the Solow model we often see in popular books does not always make clear the deep assumptions that it and many of its successors make about how the economy works. Markets in the Solow model work just as the invisible hand suggests. The economy employs the optimum amount of labor and finance, equalizing demand and supply at the appropriate wage or interest rate. And higher savings will always be invested, as suggested by Say’s Law. Finally, Solow assumes that capital investment produces diminishing returns over time. Thus, after a point, more savings will not generate a faster rate of growth. The last point was a revolutionary one, casting doubt on the value of increased savings as the main source of economic growth. This conclusion seems at odds with the thinking of conventional mainstream economists, but some have adjusted the theory to fit their convictions. The Solow model, according to some interpretations, leaves room for short-term policy adjustments. The model suggests that the level of GDP per capita can be raised by increasing the amount of capital investment per person until a “steady state” of growth is reached. Thus, it allows for government stimulus to raise investment, but only in the short run and, if one takes the model fairly literally, only the very short run. Such stimulus—say, an investment tax credit—can temporarily raise the rate of growth by enhancing the ratio of capital to labor until the economy reaches a new steady state level. Theoretically, an increase in savings under certain circumstances can have a similar result. But, to re-emphasize, the rate of growth can be raised only in the short run until the steady state of growth is reached (see Jones 2002, 29-30). Once the desired level of capital per worker is reached, the only source of faster growth in the early Solow model is new technology, not more savings or government stimulus. Thus, the Solow model leaves no room for a long-term or even a medium-term increase in rates of growth based on stimulus to aggregate demand. Also, wages are set by the invisible hand, though no doubt Solow himself would acknowledge that there is plenty of room to correct market imperfections. If markets are failing to set wages properly, perhaps through new anti-labor social norms that make layoffs acceptable or through abusive corporate power, the model would be consistent with government policies to support wage increases, such as minimum wage laws or laws enabling unions to organize. Similarly, if corporations have undue power through, for example, monopoly, government anti-trust laws are hardly inconsistent with the model. Neither are other areas of regulation, such as in markets for complex products like drugs or health care in general. These are not directly addressed by the Solow model, but it is important to understand that they can be consistent with it. But the key conclusion of the Solow model, which was that “exogenous technological change” was the source of economic growth over time, long seemed inadequate. The residual was very large, for one thing. Also, if technology mattered to economic growth, so probably did improvements in human capital through education and health care. Similarly, better transportation systems could improve economic rates of growth. The Solow model could be fairly easily adjusted to accommodate such changes. Investments in R&D, education, health care, and transportation were appended to the Solow models as potential supply-side contributions to the rate of growth.7 Because the returns to such investments are typically diffused throughout society, private markets may not adequately provide for such kinds of investment. Even with these important modifications, there was still something unsatisfactory in the Solow model. Couldn’t growth itself generate the conditions that lead to more growth? And what of savings itself? Didn’t rising levels of savings generate growth? Solow argued that investment invariably led to diminishing returns, but could investment occasionally result in greater returns? Some demand-led theorists began to argue just this point. Could growth be endogenous to the economy and there be increasing returns to investment? After all, why did the economies of rich nations continue to grow faster than those of poor nations? If labor and capital were the key considerations, they should have been cheaper in poor nations, and the invisible hand would have attracted capital investment to these countries, rapidly raising their rates of growth until their standards of living approached those of rich nations. But if higher incomes and investment themselves led to still more innovation and entrepreneurial opportunity, these movements would help explain the ongoing advance of rich nations compared to poor. Several neo-classical economists made significant adjustments to the model to accommodate the possibility that more investment in technology could yield still more commercially beneficial advances—that returns rose rather than fell as investment increased. Moreover, more investment in education and other factors might also encourage technological advance and new opportunities. The more that was invested in technology and its related factors, the faster an economy might grow because, to put it roughly, ideas generated more ideas and rich economies were in the best position to translate those ideas into commercial reality, due to existing technology, an advanced workforce, internal transportation and communications, and a large and wealthy marketplace. The most important difference between the original Solow model and endogenous growth, however, was the role of savings. In the new version, more savings could improve the rate of growth because returns on investment could now increase just by the application of investment. Technological advance was no longer exogenous, it was endogenous, a function of saving itself and the investment it led to. Now, there was again a case for the old classical idea that one could grow by saving more. The second argument for sustained strong aggregate demand is the updated version of Smith’s argument.13 Increases in demand do not merely help fully utilize otherwise underutilized resources; rather, they can also increase an economy’s productivity through a variety of processes. We have discussed some of these. Rising output can enhance productivity in part through traditional economies of scale; the more you sell in mass production and distribution, the lower the per unit cost as fixed costs like investment are amortized. Thus, the larger the market, the more pins Adam Smith’s factory can sell.14 But growing output due to government stimulus and higher wages can also stimulate further R&D investment and the development of new products. Such investment often has spillover effects, as new ideas often lead to other new ideas. The production and investment results in more learning by doing, another important source of increased productivity. You learn more about how to produce, in other words, as you do more producing. Higher output can also increase labor participation, as those sitting it out find more attractive opportunities to work. Labor may also educate itself better as opportunities rise. Greater opportunity also affects labor migration. A rising labor supply increases possibilities to grow. • Budget deficits can be acceptable to support aggregate demand. The reduction in savings in the short run is more than compensated for by increased economic activity in the longer run, which, through higher incomes, results in greater savings. • Fiscal and monetary policies should support low rates of unemployment, not merely as a social benefit but also to raise the demand for labor and to improve the bargaining power of workers, both of which can raise wages. • Government can adopt more aggressive policies to support wages, including minimum and living wage laws, favorable laws for the organization of labor, more generous unemployment insurance, and support for those who lose jobs due to international trade. Such policies may raise wages in the short run, as well as business costs, but they will often raise the rate of productivity growth over time. • The tendency of American financial institutions to over-reward short-term profits may suppress wages. Chief executives, for example, benefit significantly from their stock options when stock prices rise in the short run. There is therefore an incentive to suppress wages and employment, even if it is deleterious for the firm in the long run. Financial regulatory reforms, such as more transparent reporting, greater shareholder power, and more restrictions on how business executives are compensated, can reduce the emphasis on short-term profits. Neo-classical growth theory is to a large degree a product of the abstraction of economics. It does not fit as well with the economic history of the United States or the industrial revolution in general as is apparently believed. The best support for demand-led growth is indeed history itself, while history presents perhaps the greatest challenge to the neo-classical growth model. Take technology, which the widely held interpretation of the neo-classical growth model states is the single or overriding source of economic growth. The obsession of the media and Wall Street with the “new economy” is an example. Yet history presents a more subtle picture. Since the 1800s, all rich nations have by and large had the same access to technology. In the countries that led the industrial revolution, many of the important technologies were borrowed from other countries or older civilizations. Britain’s industrial revolution was partly based on the spinning wheel and the water mill, but it invented neither. Even American economic historian Joel Mokyr, who places “macro-inventions” at the center of economic growth, concedes that Britain borrowed new inventions mercilessly from others. America’s industrial revolution was partly based on the steam engine and Bessemer furnace, but the United States invented neither. The great French historian of European capitalism, Fernand Braudel, wrote that, “The great inventor had to have society on his side.” Technology must be exploited by society, usable by society, and even motivated by society. “So,” he continued, “if one asks the question: is there such a thing as technology in itself, the answer is bound to be no” (Braudel 1978, 431-3). The point is similar to Adam Smith’s. Although Smith did not address technology as directly, he acknowledged that new machines were required to support the division of labor, and this in turn required society and a market. The steam engine, perhaps the key machine of the modern age, was not purely a mechanical invention that caught on. It required a large market and a variety of other accommodating factors to be exploited first in Britain and then in the relatively enormous United States. Mokyr quotes a financial partner in the production of James Watt’s steam engine as follows: “It is not worth my while to manufacture in three counties only; but I find it very worth my while to make it for the whole world” (Mokyr 1992, 245). The expansion of towns and cities, the development of efficient and inexpensive transportation, the growth of a domestic market, and, in addition to that, strong export markets, were all critical to capitalist growth (Madrick 2002). Technology was not unique to any of these nations, except as it developed further due to economies of scale and related dynamic factors within the context of large markets. Large markets were perhaps the determining factor, giving rise to enormous and complex economies of scale, not only in manufacturing but also in transportation, marketing, and communications. The U.S. experience especially bears this out. The example of James Duke is illustrative. In the 1880s, Duke, America’s future cigarette baron, imported a new invention from England known as the Bonsack machine, which could manufacture 50 times as many cigarettes a day as earlier production methods. Duke had all of America before him; he knew he had to market the cigarettes aggressively to exploit fully his new machines, but the large American market provided him the potential to make the effort worthwhile. He became an aggressive pioneer of large-scale marketing, convincing Americans to smoke tobacco rather than chew it. By 1890, American Tobacco was formed, one of the nation’s giant companies then and now. Marketing became a principal function of American big business at which Americans in particular became expert. Only with a large market could Duke exploit the economies of scale of the new Bonsack machines (Chandler 1976, 290-2). This story was characteristic of American development. America’s enormous population and a market that was continent-wide, relatively easily traveled, and free of internal tariffs, that communicated through a single language, and that transacted through a single currency, propelled the industrial revolution of giant machinery and large mills and factories, 200,000 miles of railroads, and enormous oil pipelines, all before 1900. By the early 1900s, this enormous market had given rise to the mass production of the Model T and dozens of other major new mass-produced goods from washing machines to radios, which changed life more radically than at any time before or since. As economic historian Jacob Schmookler wrote: “It seems almost obvious, to this writer at least, that the automobile came when it did more because of economic and social changes than because of technological change as such. In the first place, in the automobile, prestige, flexibility, recreation, and utility are combined in ways in which only an individualistic high-per-capita society could afford to develop” (Mowery and Rosenberg 1999, 105-6). Similarly, the technologically based productivity gains of the late 1990s were, arguably, driven by mass production and mass marketing giants—companies like Intel, Microsoft, Dell, Cisco, Wal-Mart, and Fidelity Management—that exploited America’s vast and efficient domestic marketplace, rather than an abstract revolution in new technologies. Markets are not all that matter, however. Access to inexpensive resources, including coal, oil, and fertile farmland, were also important contributors, though America’s large markets enable the nation’s business to exploit the resources fully. Aggressive investment in transportation and public health were others, largely subsidized and even initiated by government. Entrepreneurial attitudes, as Joseph Schumpeter emphasized, may well have been a third. Reform of financial institutions contributed to growth. Literacy and education were vital. This is not an exhaustive list; the point is that a narrow neo-classical model, which emphasizes savings and technology, does not easily accord with the complex and subtle history of industrial and commercial growth, especially when it also ignores markets themselves as a source of growth. Large and growing markets, however, did not spare America from repeated financial panics and recessions. This raises another issue regarding government’s part in supporting growth. Only with World War II and the acceptance of the benefits of government stimulus to consumption and investment did the American economy become more stable. Largely, this was the consequence of persistently growing demand created by government spending, whether it was based on a military Keynesianism, due to the arms build-up for the Cold War, or fiscal and monetary interventions to offset recessions or raise the rate of growth, which first became explicit policy in the 1960s (Pressman 2001). Beginning with the inflationary period of the 1970s, these demand policies may have required some adjustment. But rapid growth in the late 1990s arrived only with significantly more expansive monetary policies in the late 1990s and rising wages, coupled with a high level of private borrowing to offset federal budget surpluses. The weak wage growth in the 2000s may be leading to tepid capital investment spending and a consequent reduction in future productivity growth. Economists have produced interesting analyses of whether, given that an economy is demand-led, increase in wages rather than increases in profits take the lead in producing growth. One recent study (Naastepad and Storm 2006-07) strongly suggests that in most European nations wages are the key. Wage-led growth has clear social benefits because it requires that a high share of GDP go to wages. In the United States, however, profits seem to be key. We shall see if that continues in coming years as capital investment flags in America. Among the more interesting empirical analyses of demand-led growth historically is the work of John Cornwall and Wendy Cornwall, who compared the growth performance of developed economies in the immediate post-World War II period to that of the post-1973 period in which an economic slowdown began (Cornwall and Cornwall 2001, chs. 10 and 11). The economists found that that government efforts, including America’s Marshall Plan of aid to Europe, across the OECD (the Organization for Economic Cooperation and Development) to sustain aggregate demand in the 1950s and 1960s were critical to rapid economic growth. By contrast, institutional changes, notably imbedded inflationary expectations due to the changing nature of wage bargaining in this period, led to government policies that restrained demand beginning in the 1970s. Demand-led growth theory also creates a new public policy framework for more aggressive investment in public goods, a move that can enable the nation to meet the needs of a new century and recover from the serious neglect of such needs over the past generation. Much of the economic growth of the past generation has depended on and benefited from high levels of new public investment in the 1950s and 1960s, including high technology, transportation systems, and high school and college education. But these investments have been run down without adequate replenishment. To a significant degree, for example, America has been benefiting from human capital investments made by foreign nations, from East Europe to East and South Asia, whose immigrants, once educated, have found more opportunity in the United States. America has borrowed more than just money from abroad. Neo-classical economics allows ample theoretical room for support of such public investment. Even Milton Friedman, in his popular work Capitalism and Freedom, acknowledges that there can be so-called neighborhood effects. Some kinds of investing have benefits beyond the firm. A firm that invests in a new technology, for example, might, if those discoveries are not able to be patented (and often even if they are patented), benefit other firms. A firm that trains its workers might benefit other firms if and when those workers take another job. Similarly, personal investments that many of us undertake, such as investments in our health and education, also have social benefits. In general, a healthier person is a more productive worker, and education will on balance help an individual to be a better, more sophisticated worker, a more interested and prosperous consumer, and an involved and law-abiding citizen. Because benefits extend well beyond the business or the individual, neither businesses nor individuals will tend to invest enough to create the potential benefits for all of society. Government must therefore step in. Friedman allowed for a narrow range of neighborhood effects that justify government investment, such as grade school education and the public defense (Friedman 1962, 49-51). More moderate neo-classical economists justify a wider range of public investment, including high school and college education, transportation infrastructure, and research and development, among other areas. A pillar of endogenous growth theory is that such investment can have increasing returns with spillover effects. According to demand-led theory, public investment has an additional benefit: such spending further supports demand, which in turn enhances productivity growth along with the supply-side improvements. Thus, the case for public investment is strengthened markedly. When these public needs are especially acute, deficit spending can be justified even under conditions of tight labor markets and capacity utilization. The evidence has become overwhelming in a variety of areas that public investment needs are so great that the returns to society will be substantial and in some cases may generate enough additional income and cost savings that the resulting revenues to society and individuals should more than cover the initial cost. The Congressional Budget Office adjusted its scoring policies to account for the potential stimulative effects of lower tax rates. It should similarly score the potential returns of public investment that will arise from higher tax revenues due both to growing incomes and reduced government services, like welfare. Public investment in early education provides a good example of the cost-effectiveness of such spending, as the research discussed below illustrates. Many economists agree that public investment in kindergarten through college is highly beneficial to society, and there is strong agreement as well that the greater returns are earned the earlier the educational interventions are made. Based on his own research, James Heckman, a Nobel laureate from the University of Chicago who is skeptical of government aid for college, favors aid for early education. As he and his co-author have written, “We cannot afford to postpone investing in children until they become adults, nor can we wait until they reach school-age—a time when, for some, it may already be too late to intervene successfully” (Heckman and Lochner 2000). Heckman also argues that the benefits are socially broad, including reductions in crime, reduced educational costs, and improvements in productivity. Of course, unlike most other developed countries with whom we compete, the United States does not currently have a national system of early education. Some states provide free universal early education programs but, for the most part, a hodgepodge of public and private services now fill the function, and the quality of these programs is highly uneven. Growing income inequality and the firming of the class structure in America also exacerbate the problem, as the better-off get superior early educations and go to colleges from which they get superior jobs (Haveman and Smeeding 2006). In addition to the educational and social needs of children, the radical increase in the number of dual worker and single-parent households gives early education the potential to solve another problem—the need for daycare by working spouses or single parents. Today, 60% of women work compared to 43% in 1970, and 60% of married mothers with children under 6 now work compared to 30% in 1970 (U.S. Census Bureau 2004). In addition, between 1991 and 2001 the share of children age 3 to 5 participating in some type of non-parental care increased from 69% to 74%. The labor force participation of single women with children under 6 increased from 44% in 1980 to 70% in 2003. The pressure on women in particular has been intense; moreover, there is evident prejudice against mothers on the job because it is generally expected they will leave. But can government afford the costs? A recent paper by William T. Dickens and Charles Buschnagel of the Brookings Institution estimates the effects of a universal pre-school program on government revenues. Their methodology is the equivalent of the dynamic modeling that proponents of tax cuts used to estimate future federal tax revenues, and could be adopted as a model for future CBO calculations (Dickens and Bushnagel 2007). The returns from early education affect both government revenues and the social and economic health of the society, of course. To the extent incomes rise because participants get more schooling and better jobs, additional tax revenue is produced. Moreover, these individuals are more productive, live longer (and work longer), and contribute to faster growth in the economy. More growth also produces more investment. The programs also enable parents to work more. There is strong evidence that participants in early education also require fewer special education programs, get left behind less frequently, and are less likely to commit crimes or receive welfare. All these outcomes reduce federal and local government spending, increase private earnings, and improve life. The preliminary results suggest that most and perhaps all of the federal spending will be paid back over time (Dickens and Buschnagel 2007). Various recent analyses illustrate the social and fiscal returns of leading early education programs. Four such analyses are summarized below. In each case, benefits are extrapolated into the future and discounted for the time value of money. Data were based on a compilation of information by Melissa Mahoney, a doctoral candidate at the New School for Social Research, and the recent work of Robert Lynch of the Economic Policy Institute (Lynch 2007). The Perry Preschool Project, conducted from 1962 to 1967 in Ypsilanti, Mich., identified 123 African American children from low-income families and randomly assigned 58 to a group that received two years of high-quality preschool education at ages 3 and 4. Lawrence Schweinhart (2005) conducted a cost-benefit study of the Perry project from data collected on the participants at age 40. He estimates that per participant cost was approximately $15,000, and the economic benefit of the program was $259,000 per participant (both amounts in 2000 dollars at a 3% discount rate over time), or a benefit-cost ratio of 17-to-1. Approximately 76% of the investment benefited the general public, and 24% went to the individual participant. Of the public benefits, 88% resulted from reduced crime rates, 4% from savings to educational costs, 7% from increased tax revenues resulting from higher earnings, and 1% from welfare program savings. Lynch (2004) extrapolated from individual studies to estimate the benefits of the Perry Preschool Project if it covered all children age 3 and 4 who were living in poverty in the United States through 2050. He assesses the impact of public investments in this type of program in three arenas: future total government finances, the economy, and crime. In all three, he concludes that investments over time will more than pay for themselves. Since 1967, the Chicago Parent-Child Center Program (CPC) has provided educational and family support services to children age 3 to 9 from low-income backgrounds. Twenty-four federally funded (through Title I) centers provide services to children and their families, including preschool classes for 2.5 hours per day, five days per week during the school year, a six-week summer program, and continuing educational services after a full-day or part-day kindergarten. The program emphasizes reading and math skills. Arthur Reynolds and co-authors conducted a cost-benefit study for participants at age 21; the analysis included records of educational attainment and arrests (Reynolds et al. 2002). Based just on those who attended the program during pre-school, the benefit-to-cost ratio was estimated at 7-to-1 at age 21. The benefits to individuals were largely the result of increased earnings. The benefits to the public included reduced costs of special education and being left behind, welfare program reductions, tax revenue on future earnings, and savings to the justice system. Beginning in 1972, the Abecedarian study in North Carolina provided preschool services to children from infancy to age 5 who were believed to be at risk of social and intellectual underdevelopment based on the socioeconomic characteristics of their families. The program originally identified 112 children (mostly African American). At six to 12 weeks of age, these children were randomly assigned to a preschool program group or a control group. The hours of operation of the program were 7:30 a.m. to 5:30 p.m. five days per week, 50 weeks per year. Its curriculum emphasized language development but also addressed other developmental needs of the children, and the program provided medical and nutritional services to children in the program group and control group. Masse and Barnett (2002) conducted a cost-benefit analysis of the Abecedarian Early Childhood Intervention in a study of participants at age 21. Regression analyses of the program groups and control groups over time indicate that the preschool program significantly improved measures of IQ and reading and mathematics achievement, although these effects tended to fade out over time. In addition, program participants were found to be more likely to complete four years of college and experience lower grade retention and special education participation. Program participation was also found to have significant effects on the educational attainment and labor force status of mothers. The benefit-to-cost ratio was 3.8-to-1. Interestingly, the largest shares of the total benefits came from maternal earnings, participant earnings, and reduction in health costs resulting from reduced rates of smoking and increased longevity. Since 1965, the objective of Head Start has been to improve the social and cognitive development as well as the health and nutrition of children age 3 to 5 from low-income families. Beginning in 1995, coverage was extended to children from infancy to age 2 under the Early Head Start program. Head Start and Early Head Start are administered at the local level with federal grant money, but there is considerable variation among programs. Most offer part-day, school-year pre-kindergarten classes, health screenings, and nutrition and social services. Nearly one million children are enrolled in the program, and 90% must be from families below the poverty line. No study assessing the impact of Head Start on participant outcomes and achievements has been conducted, but Currie (2001) made rough estimates of short-term and medium-term benefits and found that they may be considerable. In the medium term, for example, Currie identified the cost savings from the reduced need for special education enrollment and grade repetition. In sum, Currie found that the short-term and medium-term benefits of Head Start will offset its costs by 40% to 60%. Including long-term benefits, the program probably generates more gains than it costs. Recommendations for universal early education programs. Evidence presented in the examples of the benefits of early childhood education depends on extrapolations far into the future. The studies also measure the benefits of highly focused and notably high-quality programs. Whether such quality can be maintained in a nationwide program is always a question. Nevertheless, in light of this evidence, recommendations have been put forth for publicly funded early education programs. Some of these programs are targeted to the poor, others are universal; some are mandatory, others voluntary; some are fully financed by the government, others require some participation by parents. One such program has been proposed by Meyers and Gornick (2004). They recommend a universal, nationally funded early childhood education program that provides part- and full-time child care for children from infancy to age 3 and full-day universal preschool for children from age 3 until they enter kindergarten, usually at age 5. Some costs would be paid for by parents on a sliding scale adjusted to family income. The annual costs to government are estimated to be $95 billion if all children participate and $68 billion if only 50% of children less than 3 years old participate. Meyers and Gornick also propose a companion program of paid leave that would make six months of paid leave at 100% wage replacement available to both employed mothers and fathers following the birth or adoption of a child. The cost is estimated at $45 billion assuming 100% participation and $22.5 billion with 50% participation. Combining these two components, the total cost of Meyers and Gornick’s proposal for a more comprehensive family and work policy would fall between $107 billion and $156 billion, depending on the take-up level. The potential returns from early education are high, and studies of other public goods and services also suggest both need and opportunity. The discussion above focused on pre-K investment, but K-12 and college education will also likely generate substantial returns, if not as high. Rapidly rising costs of college have reduced opportunities for students from poorer families; even after available loans and grants, which are to some degree adjusted for income, tuition costs are much higher today as a proportion of family incomes. However, more investment in education at higher levels is less certain to show outsize returns. K-12 education in particular is fraught with difficulties, of which money is but one. Still, the nation’s educational services are distributed highly unequally, and public investment directed toward leveling the playing field is bound to have serious social and personal payoffs. Investment in energy self-sufficiency and improved transportation has been neglected in recent decades. Studies estimating the benefits from large-scale investment in energy conservation for residences and office buildings, investment in alternative fuels, and more efficient transportation systems have produced optimistic results, and several new major studies are also underway. Detailed statistical analyses by economist Ishaq Nadiri show persuasively that returns on investment in highways are easily the equivalent of or still higher than private investment in plant and equipment. Investment in R&D is not without controversy, but many economists see an ongoing need for substantially more government funds. Such research is a classic public good with broad potential social returns. One area of concern is the proportionally small number of science and engineering students in the United States. The nation relies on technical workers with strong scientific and engineering educations from abroad. But these workers are increasingly staying home as opportunities there increase and the cost of living remains far lower than in the United States. The distribution of health services is among the most complex, fractious, and potentially damaging of issues. The government estimates that within 20 years or so the nation may be spending 18%, rather than the current 15%, of GDP on health care, yet there is little reason to believe health outcomes will improve commensurately. A large-scale reform of health care may well be cost-free in the long run, due to savings in delivery, administration, and diagnostic costs, as well as better-tailored treatment and emphasis on preventive care. What is tragic is that a nation that feels its resources are strapped will not expend adequate money upfront to realize these benefits. In these areas and more, the social and personal benefits to public investment are likely to be large. Research has demonstrated these points persuasively and yet controversies remain. In theory, investment may have payoffs, but implementation must be first rate, and this is not readily guaranteed. Given success in the past, if energies are channeled correctly, enormous progress can be made. The alternative, which is ongoing neglect, will have dire consequences. As emphasized above, it is imperative that Congress demand that the Congressional Budget Office provide estimates of the fiscal revenue effects of such investments over time. The easy rejoinder is that many more assumptions are required than the CBO customarily uses to make reasonable estimates. But it would be a mistake to ignore what are clearly highly beneficial results from such investment merely because the estimation obstacles are high. The economic experience in the United States and Europe in the past quarter-century strongly suggests that high wages are important for economic growth. Economic growth and rates of capital investment were strongest when wages rose robustly in the United States between 1996 and 2000. When wages rose weakly in both the United States and Europe, capital investment and GDP growth were modest, despite rising profits. What are we to make of this? By coupling demand-led theory and empirical observations, we can draw intriguing conclusions about the policy implications. According to the prevailing growth theories today, economies are generally self-adjusting. Even when conventional growth theories endorse public investment, they also simultaneously favor minimizing government regulation and other intervention. These theories are steeped deeply in the lore of Adam Smith’s invisible hand, but without his many useful caveats. Today’s conventional wisdom holds that the best policies are to reduce government interference in the markets, make labor markets as free as possible from market-inhibiting institutions such as labor unions or laws like the minimum wage, and balance national budgets to maintain high savings in the economy. More conservative advocates of the theory believe budget deficits are tolerable if driven by tax cuts and are less sympathetic to government investment. Endogenous growth theory, however, has justified government investment in education and R&D to the extent that it can enhance the rate of productivity growth. • First, emphasis should be placed on the maintenance of demand through fiscal and monetary stimulus. • Second, increases in wages can themselves lower what policy makers consider the benchmark inflation rate, i.e., the non-accelerating inflation rate of unemployment, or NAIRU. Specifically, the unemployment rate can be driven lower without incurring accelerating inflation. In general, the Federal Reserve should take the risk of erring on the side of producing annual inflation rates greater than 2% by tolerating lower levels of unemployment and higher levels of wage growth. More demand will help generate higher levels of productivity, enabling business to pay higher wages and maintain profit margins without raising prices. • Third, should more expansive monetary policy stimulate dangerous levels of financial speculation, which it has done over the last 10 years, regulations and tighter watchdog policies should be imposed. The nation can have expansive monetary policy and limit speculative excess simultaneously. • Fourth, aggressive social policies, including minimum wages, living wages, and laws favorable to the organization of labor, may not only raise the level of social justice but can also improve the rate of growth of productivity. • Fifth, policies and institutions can be adjusted to make the U.S. economy wage-led rather than profit-led. These efforts may include financial reforms. Thus, GDP growth could be generated with a more equitable and socially just distribution of income. • Sixth, in light of the need for persistent strong aggregate demand, higher budget deficits can be tolerated. Because higher aggregate demand due to fiscal stimulus can enhance productivity, such deficits can help generate more growth over time, and therefore more savings to support investment. • Seventh, deficits created to support needed public investment are eminently affordable. They have both demand-side and supply-side effects, supporting aggregate demand on the one hand and education, infrastructure, and R&D on the other. A systematic and ongoing effort should be established by the CBO to score the effects of such investment dynamically on the future federal budget. America is a rich nation, but since the difficult economic circumstances of the 1970s it has acted like it is not. One of the inappropriate lessons America learned then was that too much government is bad. Sadly, mainstream economics contributed to this view. The lesson that should have been learned is that bad government is bad. At times, government has done its job poorly, but good government has a central part in the economy. That role has been tragically restricted for a generation, partly because of the new economic conventional wisdom. Government should have access to a far wider range of policy options than many advisers now offer. Without such options, the nation will not meet the needs of a changing time. — Jeff Madrick is the editor of Challenge Magazine, visiting professor of humanities at The Cooper Union, and director of policy research at the Schwartz Center for Economic Policy Analysis, The New School. He is also a regular contributor to The New York Review of Books and The Nation. His latest book is Why Economies Grow. 1. This is not to say that domestic savings are not desirable. The need to import capital may restrict policies and keep a currency high, thus dampening manufacturing investment, for example. But demand-oriented policies and high wages may also be the best way to raise domestic savings. 3. For fine summaries, see Setterfied (2001) and Targetti and Kaldor (1992). John Kenneth Galbraith said that writing down one’s views gives one’s enemies the greatest of gifts (Galbraith 1985). Readers should be well aware that the assertions in this paper are supported by serious academic theorizing reaching back to Roy Harrod, the economist and biographer of Keynes; Allyn Young of the London School of Economics; Nicholas Kaldor of Cambridge University and many of his colleagues; and Michal Kalecki, the great Polish economist, not to mention Keynes himself. The work has been extended by serious scholars today on both sides of the Atlantic, such as Anthony Thirwall in Britain; Servaas Storm of the Netherlands; and, in America, the veteran economist Lance Taylor and a large number of younger, energetic economists such as Robert Blecker, Mark Setterfield, James Galbraith, and a contributor to this Shared Prosperity series, Thomas Palley. I would like especially to thank Mark Setterfield for his many useful writings on this subject, as well as many e-mail correspondences to clarify and fill in the blanks of my own knowledge. 4. As noted, there is a varying degree of support for the consensus, but it is fair to say it acts like a gravitational force on most mainstream economists. 5. For the latest work on this, see Go and Lindert (forthcoming). 7. See two classic papers, Nelson and Phelps (1966) and Mankiw, Romer, and Weil (1992). 8. A technical defense of the original exogenous Solow model was also developed, though it allowed for investment in human capital. See Mankiw, Romer, and Weil (1992). 9. For a good analysis see Roberts and Setterfield (2005). 10. On the “capture” of growth theory by the neo-classicals, see Palley (1996). 11. Such theoretical models usually derive from the work of the Polish economist Michal Kalecki, a contemporary of Keynes. The Cambridge University economist Joan Robinson built upon his work, followed by several waves of innovators. “[A]t any point in time, the utilization of existing productive resources is determined by demand conditions that are relatively autonomous from the conditions of supply. The sequence of short-term outcomes … traces out the economy’s long-run growth path, without displaying any tendency to gravitate automatically towards the potential output path of the economy” (Setterfield 2003, 26). 12. For a first-rate review of many of these models, see Blecker (2001). 13. The pioneering work in the areas was performed by the Cambridge University economist Nicholas Kaldor. 14. The relationship between output and productivity, for which there is considerable empirical support, was formalized by the Dutch economist Petrerus Johannes Verdoorn. It is now known as Verdoorn’s Law. 16. Setterfield (2003). See p. 27 in particular for a summary and references to this research. 17. See in particular Baker et al. (2005). Baker, Dean, Andrew Glynn, David Howell, and John Schmitt. 2005 “Labor Market Institutions and Unemployment: A Critical Assessment of the Cross Country Evidence.” In David Howell, ed., Questioning Liberalization: Unemployment, Labor Markets and the Welfare State. Oxford University Press. Blau, David M. 2003. “Child Care Subsidy Programs.” In Robert A. Moffit, ed., Means-Tested Transfer Programs in the United States. Cambridge, Mass. : National Bureau of Economic Research. Blecker, Robert. 2001. “Distribution, Demand and Growth in Neo-Kaleckian Macro Models.” In Mark Setterfield, ed., The Economics of Demand-Led Growth. Cheltenham, England: Edward Elgar. Blinder, Alan, and Alan Krueger. 2004. “What Does the Public Know About Economic Policy, And How Does It Know It?” Working Paper 10787. Cambridge, Mass. : National Bureau of Economic Research. Blinder, Alan, and Janet Yellen. 2001. The Fabulous Decade: Macroeconomic Lessons From the 1990s. New York, N.Y.: Century Foundation. Braudel, Fernand. 1978. The Structures of Everyday Life: Civilization and Capitalism 15th-18th Century. Volume 1. New York, N.Y.: Harper & Row. Chandler, Alfred. 1976. The Visible Hand: The Managerial Revolution in American Business. Cambridge, Mass. : Belknap Press. Cornwall, John, and Wendy Cornwall. 2001. Capitalist Development in the Twentieth Century: An Evolutionary Keynesian Analysis. Cambridge University Press. Currie, Janet. 2001. “Early Childhood Education Programs.” Journal of Economic Perspectives, 15(2): 213-38. Diamond, Jared. 1999. Guns, Germs, and Steel. New York, N.Y.: W.W. Norton. Dickens, William, and Charles Buschnagel. 2007. “Dynamic Estimates of Fiscal Effects of Investing in Preschool Education.” Washington, D.C.: Brookings Institution. Eisner, Robert. 1986. How Real Is the Federal Deficit? New York, N.Y.: Free Press. Elmendorff, Douglas, Jeffrey Liebman, and David Wilcox. 2002. “Fiscal Policy and Social Security Policy During the 1990s.” In Frankel and Orsag (2002). Feldstein, Martin. 2002. Comments on Elmendorff, Liebman, and Wilcox (2002). In Frankel and Orsag (2002). Frankel, Jeffrey, and Peter Orsag, eds. 2002. American Economic Policy in the 1990s. Cambridge, Mass. : MIT Press. Friedman, Benjamin. 1988. Day of Reckoning: The Consequences of American Economic Policy Under Reagan and After. New York, N.Y.: Random House. Friedman, Milton. 1962. Capitalism and Freedom. University of Chicago Press. Galbraith, John Kenneth. 1985. The New Industrial State. Fourth Edition. New York, N.Y.: Houghton Mifflin. Glyn, Andrew. 2006. Capitalism Unleashed: Finance, Globalization and Welfare. Oxford University Press. Go, Sun, and Peter H. Lindert. Forthcoming. “The Curious Dawn of American Schools.” University of California-Davis. Gordon, Robert. 2003. “Exploding Productivity Growth: Context, Causes, and Implications.” Brookings Papers on Economic Activity 2:2003. Washington, D.C.: Brookings Institution. Haveman, Robert, and Timothy Smeeding. 2006. “The Role of Higher Education in Social Mobility.” Future of Children, Fall. Heckman, James, and L. Lochner. 2000. “Rethinking Education and Training Policy: Understanding the Sources of Skill Formation in a Modern Economy.” In S. Danziger and J. Waldfogel, eds., Securing the Future: Investing in Children From Birth to College. New York, N.Y.: Russell Sage Foundation. Jones, Charles. 2002. Introduction to Economic Growth. New York, N.Y.: W.W. Norton. Lindert, Peter. 2004. Growing Public, Social Spending and Economic Growth Since the Eighteenth Century. Cambridge University Press. Lynch, Robert. 2004. Exceptional Returns: Economic, Fiscal, and Social Benefits of Investment in Early Childhood Development. Washington, D.C.: Economic Policy Institute. Madrick, Jeff. 2002. Why Economies Grow. New York, N.Y.: Basic Books and Century Foundation. Mankiw, Gregory, David Romer, and David Weil. 1992. “A Contribution to the Empirics of Economic Growth.” Quarterly Journal of Economics, May. Masse, Leonard, and W. Steven Barnett. 2002. A Benefit Cost Analysis of Abecedarian Early Childhood Intervention. New Brunswick, N.J.: National Institute for Early Education Research. Meyers, Marcia, and Janet Gornick. 2004. Work/Family Reconciliation Policies for the United States: Lessons from Abroad. Mimeo. Mokyr, Joel.1992. Lever of Riches: Technological Creativity and Economic Progress. Oxford University Press. Mowery, David, and Nathan Rosenberg. 1999. Paths of Innovation: Technological Change in 20th Century America. Cambridge University Press. Naastepad, C.W.M, and Servaas Storm. 2006-07. “OECD Demand Regimes (1960-2000).” Journal of Post-Keynesian Economics, Winter, pp. 213-48. Nelson, Richard, and Edmund Phelps. 1966. “Investment in Humans, Technological Diffusion, and Economic Growth.” American Economic Association Papers and Proceedings, Nashville, Tenn., May. Palley, Thomas. 1996. “Aggregate Demand in a Reconstruction of Growth Theory: The Macro Foundations of Economic Growth.” Review of Political Economy 15(3): 23-32. Pressman, Steven. 2001. “The Role of the State and the State Budget.” In Richard P.F. Holt and Steven Pressman, eds., A New Guide to Post Keynesian Economics. Hampshire, England: Routledge. Reynolds, Arthur, Judy Temple, Dylan Robertson, and Emily Mann. 2002. Age 21 Cost-Benefit Analysis of the Title I Chicago Child-Parent Centers. Discussion Paper No. 1245-02. Madison, Wis.: Institute for Research on Poverty. Roberts, Mark, and Mark Setterfield. 2005. “What Is Endogenous Growth Theory?” Unpublished. Romer, Paul. 1986. “Increasing Returns and Long-Run Growth.” Journal of Political Economy 94(5): 1002-37. Schweinhart, Lawrence. 2005. The High/Scope Perry Preschool Study Through Age 27: Summary, Conclusions, and Frequently Asked Questions. Ypsilanti, Mich.: High/Scope Press. Setterfied, Mark. 2001. Macrodynamics. In Richard P.F. Holt and Steven Pressman, eds., A New Guide to Post Keynesian Economics. Hampshire, England: Routledge. Setterfield, Mark. 2003. “Supply and Demand in the Theory of Long Run Growth.” Review of Political Economy, January. Slemrod, Joel. 1995. “What Do Cross Country Studies Teach About Government Involvement, Prosperity and Economic Growth?” Washington, D.C.: Brookings Institution. Solow, Robert M. 1956. “A Contribution to the Theory of Economic Growth.” Quarterly Journal of Economics, February. Stokey, Nancy, and Sergio Rebelo. 1993. “Growth Effects of Flat-Rate Taxes.” Working Paper No. W4426. Cambridge, Mass. : National Bureau of Economic Research. Storm, Servaas, and C.W.M. Naastepad. 2006. It Is High Time to Ditch the NAIRU. Delft University. Targetti, Ferdinando, and Nicholas Kaldor. 1992. “The Economics and Politics of Capitalism as a Dynamic System.” In Laws of Growth. Oxford, England: Clarendon Press. U.S. Census Bureau. 2004. Statistical Abstract of the United States: 2004-05, 124th Edition. Washington, D.C.: U.S. Government Printing Office.